Highly awaited every year by students and their families, l’Etudiant magazine’s ranking of France’s engineering schools has just been published. For the 2019 edition, 174 public and private engineering schools, recruiting students after the high school diploma or after two years of higher education, were examined based on fifty criteria. Where do the data for the rankings come from? This ranking is based on data for 2017-2018 provided by each school and certified by the French Accreditation Board (CTI) and the Association of French Engineering School Directors (CEDEFI). Why does “ECAM Lyon-Strasbourg” appear in the survey when ECAM Lyon and ECAM Strasbourg-Europe are two different schools? The data is for the 5 engineering programs of the ECAM Foundation, which is the owner and guarantor of the degrees awarded by the two schools, ECAM Lyon and ECAM Strasbourg-Europe. These 5 engineering programs are taught at ECAM Lyon and one of them – ECAM Arts et Métiers – is also taught at ECAM Strasbourg-Europe. What criteria are the schools ranked on? Some fifty indicators are brought together in three key categories that are essential when choosing a school: academic excellence, international dimension and close relationships with companies. All Web users are free to select the criteria of their choice to fine-tune their ranking, based on the indicators they see as important. Find out more about l’Etudiant magazine’s ranking methodology. 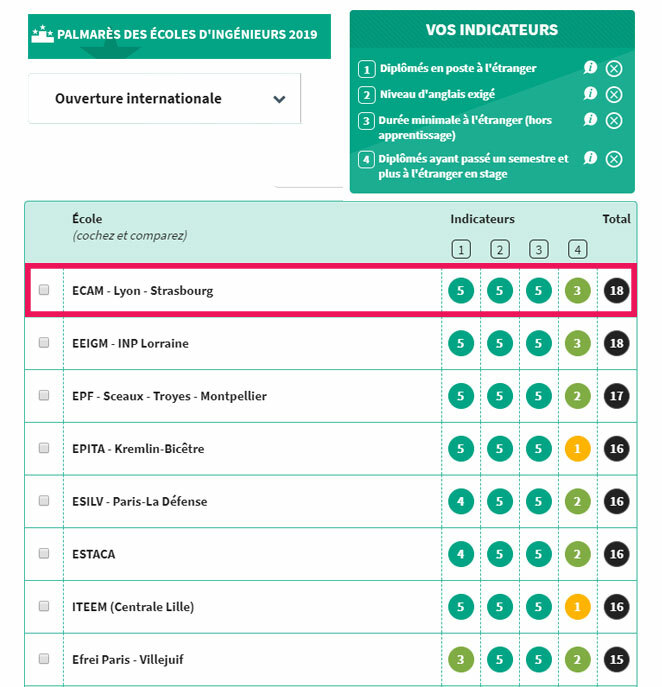 With 31 points in the overall ranking, ECAM Lyon came in at 19th place for post-high school engineering schools (and 5th for private schools). This great recognition of ECAM Lyon consolidates its position compared to last year’s ranking. ECAM Lyon is among the top 10 private post-high school engineering schools in France in each of the ranking’s three main categories: academic excellence, international dimension and close relationships with companies. 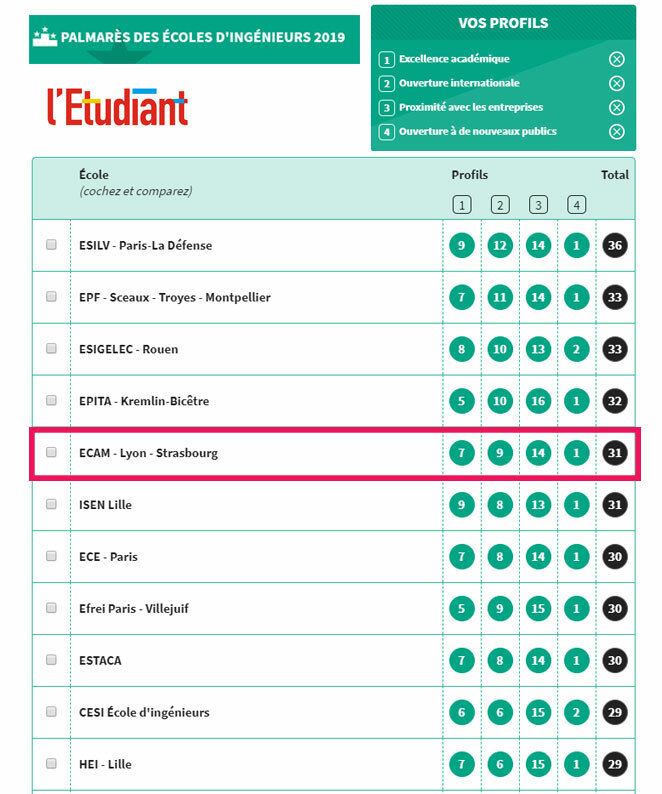 See l’Etudiant magazine’s complete ranking. Find out more about this ranking. 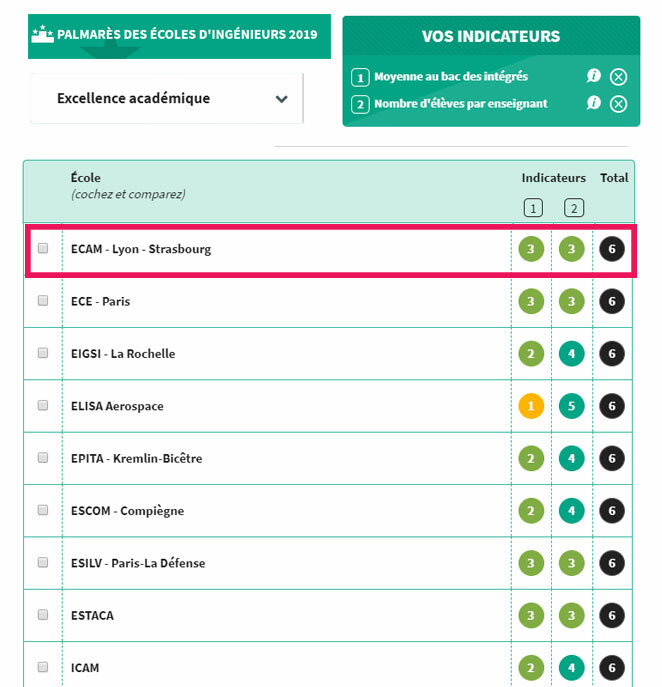 ECAM Lyon / Strasbourg comes in at 2nd place among 31 private post-high school engineering schools in the “Academic Excellence” category, based on two cornerstones of its educational program: high standards and support for students. What criteria are taken into account? The average score of incoming freshmen on the French Baccalauréat high school diploma (which rose to 15.03 in 2018 compared to 14.57 in 2017) and its excellent student-to-teacher ratio, with 11.6 students per teacher. These figures testify to the growing determination and commitment of ECAM Lyon’s staff to provide each student with personalized support while maintaining high academic standards in all training programs.